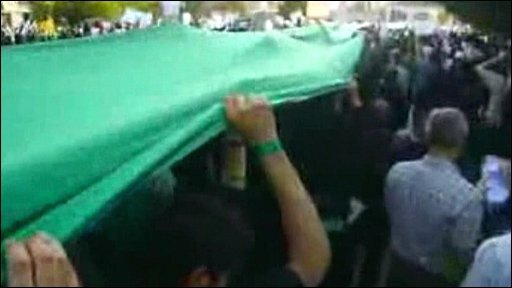 Amateur footage captures a march through central Tehran on Thursday by supporters of defeated presidential candidate Mir Hossein Mousavi. The demonstration was held a day after Mousavi called for peaceful protests, following the death of some of his supporters. Demonstrators carried a long green banner through the streets, a symbol of the opposition movement.